We have 0 member(s), 1 spiders, 6 guest(s), and 0 anonymous users online. Welcome to our ad-free space art community! If you're looking for information on how to create good-looking space art, you've come to the right place. Our members are always happy to share their techniques and tricks, and we have a wide selection of tutorials that focus on various aspects of space art creation. Please feel free to post your finished works for all to see and comment on, as well as your works in progress. If you're stuck on a particular problem area, please don't hesitate to ask for help or suggestions. We have many extremely talented artists here and they're always ready to help out, no matter what media or software you are using to create your artwork. realmoh - "Martian Landscape II"
realmoh - "Red Worlds - Ross 128 b"
Rockets are they redunant and too costly? What up you creative astronauts! GRAIL Probes Image Farside of Moon! We never get to see the far side of the moon, so this is a pretty cool video. I wanted to take a moment and wish everyone here at Solar Voyager a very happy and prosperous new year! It's been my pleasure to host this community of space artists for the past 7 years and I plan to continue doing so without annoying ads, pop-ups or other distracting junk to detract from the awesome space art. Please remember that we have a system in place for nominating images in our Member's Gallery forum for inclusion in the Solar Voyager header, so if you see an image that you think is exceptional, please click on the "Nominate" button and let us know that you think it should be featured. 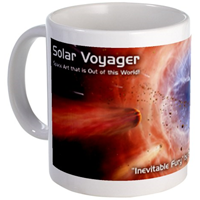 Speaking of the header, many of the beautiful images in our website header are available on ceramic mugs from our Solar Voyager Store over at CafePress. Please take a look and see if there is something you'd like. Finally, I'd like to thank my volunteer staff of moderators, JanL (Jan), Voyager (Maciej), Regulus (Brian) and Reimbrandt (Reimund), who are instrumental in helping keep things here at Solar Voyager running smoothly -- It sure is great to be able to depend on you guys! Again, Happy 2012 to everyone and let's see what you've been creating! Announcing the Solar Voyager Store! Observant members may have noticed that a new selection appeared in our menu last week: "Solar Voyager Store" -- This is a new feature of the site where you can pick up various merchandise with space art from Solar Voyager's header! At present we have several products that feature 8 different pieces of art, including the original Solar Voyager header image. The current products are mugs and steins, but as time goes on and we receive permission from the artists, we'll add more items with more artwork from the header. The BIG DEAL we're planning on is a Solar Voyager space art calendar -- something I've wanted to do for a long time! Proceeds from the sale of these items will go to pay for Solar Voyager's website hosting and bandwidth costs, helping keep our ad-free site affordable for Yours Truly. Please check out the store, which is powered by CafePress, and let me know if there are items (T-shirts, iPad cases, etc.) you'd like to see. Finally, remember that items in the store will use artwork from the Solar Voyager header, and that you can nominate pieces in the Space Art Gallery for inclusion in the header by clicking on the "Nominate" button in the first post of any Gallery topic! I'm happy to announce that Solar Voyager now has an active "Downloads" area! This section is a place where you can get cool image components, custom brushes for use in Photoshop and other paint programs, and space-related 3D models for use in 3D packages such as 3ds Max. Download these items and use them in your own space art! Several files are available now, with more to come. Solar Voyager members can also contribute new content to this area -- all contributed items must be your own work and free of any copyright restrictions. Submitted items are subject to review by Solar Voyager staff.